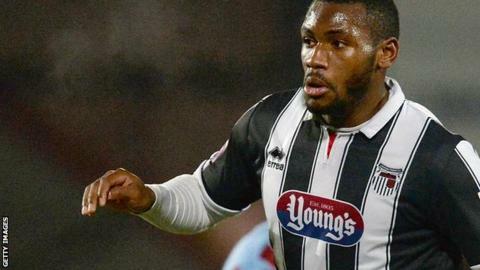 Lenell John-Lewis scored one goal and created another against Forest Green to help Grimsby move into the Conference play-off places. John-Lewis was foiled by keeper Sam Russell before meeting Carl Magnay's cross to steer home the opener. Chris Stokes levelled with a volley and James Norwood twice tested Mariners keeper James McKeown. Craig Disley got on the end of a John-Lewis pull back pass to win it and lift Grimsby to fourth in the table. "It's our fault, isn't it? We just had chance after chance after chance but we didn't score any goals. "We came to a big club like this and we battered them and we didn't get a reward for it. "I thought Jon Parkin was different class again. He's becoming what I want him to be - his hold up play, his work rate - he's doing really well." Match ends, Grimsby Town 2, Forest Green Rovers 1. Second Half ends, Grimsby Town 2, Forest Green Rovers 1. Substitution, Grimsby Town. Paul Bignot replaces Carl Magnay because of an injury. Foul by Carl Magnay (Grimsby Town). Attempt missed. Jon Parkin (Forest Green Rovers) header from a difficult angle on the left misses to the left. Assisted by Sam Wedgbury with a cross. Substitution, Forest Green Rovers. Dale Bennett replaces David Pipe because of an injury. Substitution, Grimsby Town. Scott Neilson replaces Jon-Paul Pittman. Substitution, Forest Green Rovers. Lee Hughes replaces James Norwood. Attempt saved. James Norwood (Forest Green Rovers) right footed shot from outside the box is saved. Goal! Grimsby Town 2, Forest Green Rovers 1. Craig Disley (Grimsby Town) right footed shot from the left side of the six yard box to the bottom left corner. Assisted by Jon-Paul Pittman. Attempt missed. Jon Parkin (Forest Green Rovers) right footed shot from outside the box misses to the right from a direct free kick. Carl Magnay (Grimsby Town) wins a free kick. Goal! Grimsby Town 1, Forest Green Rovers 1. Chris Stokes (Forest Green Rovers) left footed shot from outside the box to the top right corner. Carl Magnay (Grimsby Town) is shown the yellow card for dissent. Attempt saved. Scott Brown (Grimsby Town) right footed shot from outside the box is saved. Offside, Grimsby Town. Scott Brown tries a through ball, but Scott Brown is caught offside.